I love cranberry sauce. It just tastes like fall. Whole berry sauce. Not jellied. That just looks a little too processed to me when you slide it out of the can and it still has the lines on it. At least with canned whole berry sauce, you can stir it up and have it look like the real stuff. But cranberry sauce is SO easy to make you never need to buy it. It takes less than 5 minutes of hands-on time to make a batch of beautiful, red, delicious cranberry sauce. Cranberries are naturally very tart. You will something to sweeten them when making cranberry sauce. I use my own blend of xylitol, erythritol, and stevia in my recipes. This is twice as sweet as sugar. It is comparable to Trim Healthy Mama Gentle Sweet and Truvia. Making my own sweetener blend saves a ton of money. I can make it for about $6 a pound and since it is twice as sweet as sugar it lasts longer than blends with a 1:1 sugar ratio. This sugar-free cranberry sauce is delicious as a surprise cupcake filling in the Cranberry Cupcakes pictured above! And I love having some sugar free cranberry sauce on hand to put on top of my Cranberry Baked Brie. 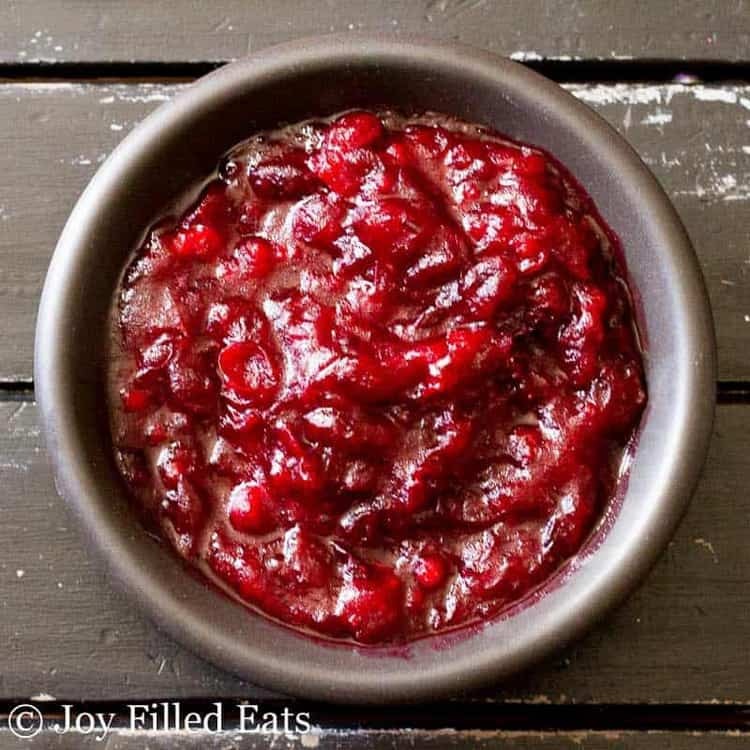 This homemade cranberry sauce will last for weeks in the refrigerator. 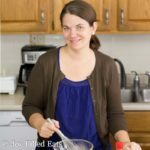 I make a double batch before Thanksgiving and use it until the new year! 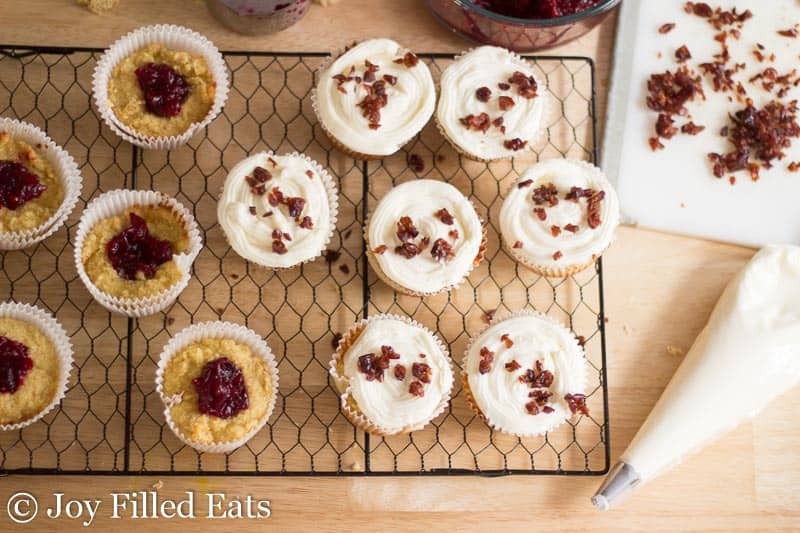 Besides serving cranberry sauce with turkey I use it in these cupcakes and baked brie. I also use cranberry sauce as a condiment to pork and chicken and in coffee cakes such as my Cranberry Cake with Walnut Topping. I make it and use it on salad as a dressing. Have you tried making it jellied with your recipe? My family likes jellied and It seems like it would be fine, but wonder if anyone tried it. I have not but it should work. I would puree it and then strain it. Usually I just pour them into a wire strainer and then mash them with a spoon into a bowl. I actually think those are the directions on the package. It doesn't take long and works great! I am making it tomorrow sounds great, had a bag of cranberries,did not know what to do with it, I will like to add some orange to it.thanks for sharing. Soooo good. I put some of it still warm over some cream cheese! Yum! Oh! I LOVE this idea! I made this last year and it was so good. I'm going to have to make a double batch this year! This is going to be great for Thanksgiving, I have a few family members doing keto! This looks delicious and so easy to make! I've made a cranberry orange relish but I love your version with the vanilla and cinnamon. I'm keeping this in my back pocket for the fall holidays. I'm excited to make this recipe! 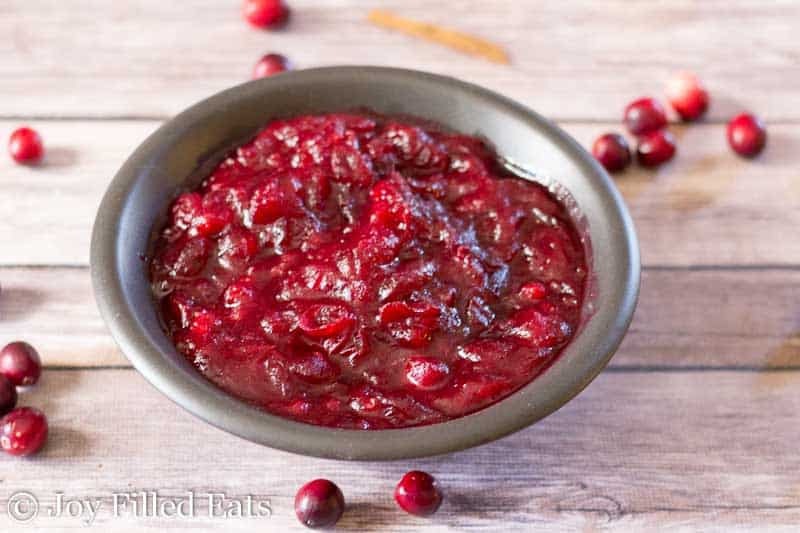 I love homemade cranberry sauce, but I don't like them too sweet! Could this be done with strawberries? I’ve made you “tagalong” sour cream cupcakes and have wanting to experiment by making strawberry cheesecake cupcakes with the base recipe. I was think abt the filling being strawberries and the frosting being a pink cream cheese frosting. Thoughts? No wonder I never liked the canned stuff. This recipe is amazing. All 4 of my kids love it too. I always make your baked brie recipe with it too. Yum! This is awesome. I put some orange zest in mine while it was still hot. Sooooo good. I bought a big bag of cranberries from Costco. Do you know approximately how many cups of cranberries in a 12 oz bag? No, but google did :) "There are 3 cups of cranberries in one 12-ounce bag." Just pulling off the stove and it smells delicious! So easy! I have never bought cranberries. 12oz bag, are they frozen? Or in produce? This time of year they are in produce. Off season you can find them frozen. Thanks found them. Oh this cranberry sauce is so good and I usually am not a fan. 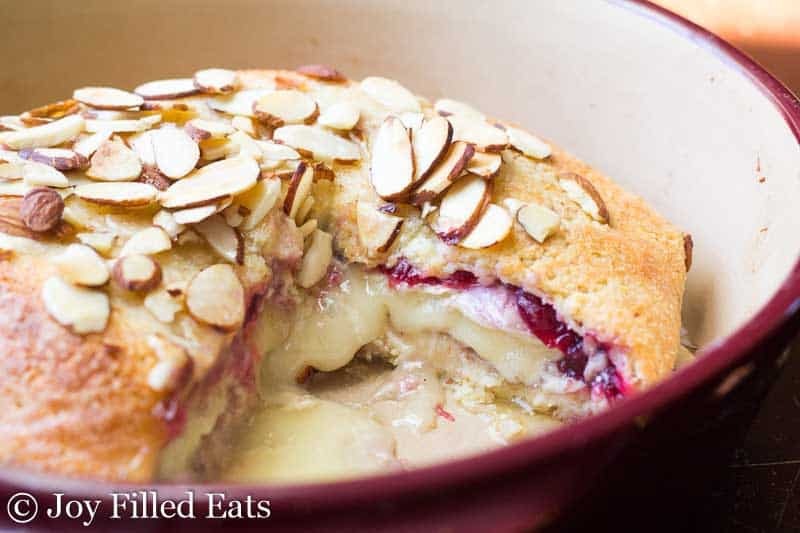 Have some in your baked brie recipe cooking right now! I LOVE how easy your recipes are. How much sauce does this recipe make? Enough for your cranberry swirl cheesecake bars (1.5 cups)? Thanks! Yes, this makes about 2 cups. Wonderful recipe! I adore cranberry sauce on turkey sandwiches and this was a perfect swap for the canned stuff. Only adjustments I made were 6 oz of water instead of 4, and .75 c gentle sweet instead of 1 to avoid it being overly sweet. Thank you so much for posting this!! What is the purpose of sweetening with 3 different products? Why not just pick one and make the cranberry sauce that way? You could do that but I prefer the flavor of the blend. Just stevia can be bitter and just erythritol can have a weird cooling affect. It is also cheaper to add a little stevia to the sugar alcohols to stretch them. You need half as much that way. Awesome! I made it in the Instant Pot for 8 minutes HP, NR instead of doing it on the stovetop. I really like the flavor of the cinnamon with the cranberries, even though it's not as 'traditional' as the canned stuff I've always had. Next time I make it I may cut back a bit on the Gentle Sweet so it's a bit more tart. As it is, it is great for a sweet topping (and I'm dreaming of it on brie!). I'm never buying the canned stuff again! :) Thanks!